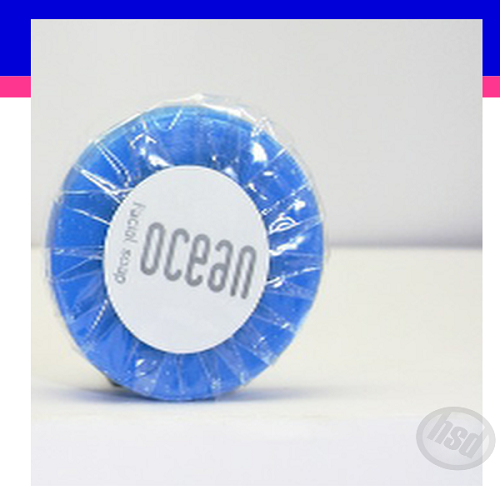 Hotel "OCEAN - Body Bar Soap Collection, BLUE Round Pleated Bar. OCEAN Collection. Green Tea Fragrance, infused with Aloe Vera . Its inviting fragrance evokes the wild and vibrant spirit of the ocean. A collection with a personality derived from a unique design and electric color inspired by the mesmerizing blue of the Atlantic. With natural and organic ingredients, the Ocean collection provides extra hydration, leaving your skin smooth all day long. This collection is also perfect for those SEA SIDE accommodations in which you would like to add a touch of pacific paradise to your rooms.